Learn more about the 20'th Dynasty. Details: The mummy of Ramesses III was fairly intact when it was discovered in DB 320, and Maspero had it partly unwrapped on June 1, 1886, in the presence of the Khedive Tewfik. Since some of the resin-impregnated bandages had solidified into a hard, shell-like carapace, the decision was made to leave them in place rather than risk damaging the mummy in the difficult process of removing them. This prevented a full examination of the mummy which might have uncovered any wounds indicating that Ramesses III had indeed been assassinated by the conspirators named in the Harem Conspiracy Papyrus. (See Ian Bolton's page on the Harem Conspiracy.) Years later, when the mummy was x-rayed, three figures of the sons of Horus, probably made of wax, were found in the thoracic region. Official Inspections/Restorations: As evidenced by a linen docket found on his wrappings, Ramesses III was "Osirified" (r rdit wsir) in Year 13 2 smw (27?) of Smendes/Pinudjem I. The docket further names the men in charge of this operation: Butehamun, the well-documented royal necropolis scribe from Dier el-Medina, and a temple scribe named Djesersukhons. Reeves connects graffiti inscriptions found in the burial chamber of KV 11 with this event because they also name Butehamun (and his son, Pakhyneter.) Champollion also recorded another graffiti from KV 11, naming a "god's father Hori," but Reeves notes that this is not very legible in Champollion's text and is therefore of minimal value in helping to determine the chronology of events in the tomb. Photo Credit: RM (Cairo, 1912,) pl. L. For high resolution photos of Ramesses III see the University of Chicago's Electronic Open Stacks copy of Smith's The Royal Mummies (Cairo, 1912,) Call #: DT57.C2 vol59, plates L, LI, and LII. ) Recent images of the mummy of Ramesses III may be seen at the Eternal Egypt website. Details: The mummy of Ramesses IV was discovered in side-chamber Jb of KV 35 (at position 9--see diagram) and was unwrapped by G. E. Smith on June 24'th, 1905. It had been covered by a shroud on which appeared a Type A Linen Docket (See Linen Docket translation below.) Beneath this lay a mass of tattered bandages which were all that remained of the original wrappings. These had been shredded by ancient tomb robbers in their search for valuable objects, and the restorers had simply repositioned them over the mummy in a tangled disarray without making any attempt to repair or straighten them. Beneath these bandages lay the relatively intact mummy of Ramesses IV, which had sustained only minor damage at the hands of the thieves. One of his feet had been broken off but was still present with the other remains. A hole was also found in the skull of Ramesses IV, similar to those found in the skulls of Merenptah, Seti II, Ramesses V (see below) and Ramesses VI (see below)--all of whom were found along with Ramesses IV in KV 35. (But note differences in the skull wound of Ramesses V, discussed in his entry below.) As noted before, Maspero believed these cranial openings served some unknown ritual purpose, perhaps functioning as a portal through which evil spirits could escape. Smith's theory, however, seems more plausible. He felt that the holes in the skulls of these mummies were made by thieves who had employed the same kind of tool--most likely an adze--in the same fashion in order to first cut through the bandages of the head in their attempt to strip the mummies of their outermost wrappings. Smith comments that the finger nails of the mummy are missing, but they could have dropped off during the embalming process (especially if they had not been secured to the fingers with string prior to the natron treatment) and their absence is not necessarily the result of damage done by tomb robbers as Smith concluded. (However, Smith describes some of the nails as "displaced," indicating that some were present, and had been detached from the fingers. This strengthens his belief that the nails had been dissociated from the fingers when thieves ripped through the wrappings.) Ramesses IV also exhibited a crescent shaped band of black paint on his forehead, similar to the one found on the mummy of Siptah. His body cavity was packed with dried lichen, also similar to the lichen packing used in Siptah's mummy. Smith also notes that the skin of the forehead and neck were partly eaten away by insects. 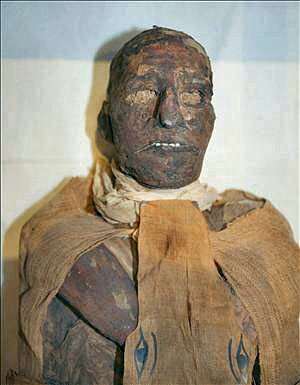 This may indicate that Ramesses IV had not been mummified immediately upon his death. Photo Credit: RM (Cairo, 1912,) pl. LIII. For high resolution photos of Ramesses IV see the University of Chicago's Electronic Open Stacks copy of Smith's The Royal Mummies (Cairo, 1912,) Call #: DT57.C2 vol59, plates LIII, LIV and LVII.) Recent color images of the mummy of Ramesses IV may be seen at the Eternal Egypt website. Details: The mummy of Ramesses V was found in side chamber Jb of KV 35 (at position 6--see diagram.) 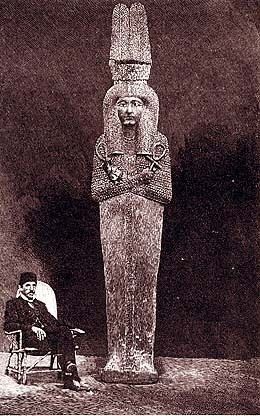 It was unwrapped by G. E. Smith at the Cairo Museum on June 25, 1905. Beneath an outer shroud (on which appeared a Type A Linen Docket--see below) lay a mass of torn bandages, probably all that remained of the original wrappings after they had been mangled by tomb robbers in their search for valuables. As in the case of the mummy of Ramesses IV (see above) no attempt had been made to restore these bandages to any semblance of their original order, and they had simply been thrown carelessly over the mummy. Smith makes the interesting observation that some of these bandages showed signs of being burnt by a corrosive agent. As in the case of Tutankhamen's charred wrappings, which had been slowly oxidized by the oils poured upon them during the funeral ceremony, the burns on the linen bandages of Ramesses V may have also been the result of chemical reactions involving the organic substances used during the embalming and funerary rituals. Smith commented that Ramesses V had been a much younger man than his predecessor, and noted that his body had been very well preserved. Ikram and Dodson place his age at death as being in the early thirties. The face had been painted red (probably in imitation of the red coloration used for men's faces in paintings and on statues) and linen had been packed under his eyelids to form artificial eyes. The ears of Ramesses V had been pierced and the holes had been greatly enlarged to such an extent that the lobes were stretched into what Smith described as "strings" of dangling tissue. Smith had observed this kind of lobular elongation in some of the other royal mummies, and it provides more interesting evidence for the practice of decorative body modification among the Egyptians similar to that practiced by other African peoples. After removing the brains, the embalmers had packed the skull of Ramesses V with 9 meters of linen, inserted through the right nostril. Both nostrils had then been plugged with wax. The embalming incision on the abdomen was large and gaping, and is clearly visible in the photo above. The viscera, although removed according to ancient tradition, had been reinserted into the abdomen, along with a quantity of sawdust, and were found lying loose and unwrapped. The reinsertion of the internal organs into the body cavity anticipates a custom that would become common in the XXI'st Dynasty. Thieves had done relatively little damage to the mummy beyond chopping off some of the finger tips of the left hand with the sharp instrument used to hack through the bandages. In this process, they had also sliced off some of the skin from the knuckles. As in the cases of Merenptah, Seti II, Ramesses IV (see above) and Ramesses VI (see below), the skull of Ramesses V also exhibits a hole, which Smith described as located "in the left parietal bone, just behind the coronal suture and close to the middle line." (See link to Plate LVII below for photograph of this hole.) However, this wound differs significantly from those found in the other KV 35 mummies, whose scalps had been completely desiccated when the holes in their skulls had been made. Smith comments that the scalp immediately behind the cranial opening in Ramesses V is rolled back in a fashion that could only occur when the scalp still retained its resiliency, i. e. before or immediately after death, and certainly prior to mummification. Smith also noted that there is a large area of discoloration around this cranial opening and an area of some type of blackened substance which looked to him like ante-mortem dried blood. Although Smith never speculated about the cause of this particular injury, it does suggest that Ramesses V may have died from a blow, made by a sharp instrument, to the top left portion of his head. Professor A. R. Ferguson, who examined the mummy, pointed out that skin eruptions found on the face, lower abdomen, and pubic region also suggest the kind of skin rash which occurs in cases of smallpox. While this disease is usually named as the cause of Ramesses V's death, the hole in the skull, further described by Smith as being "obliquely placed" and "irregularly elliptical" is extremely interesting, especially in view of the scalp distortions and possible ante mortem-bleeding which seem to have accompanied it. Smith described the scrotum of Ramesses V as "large and baggy," and notes that it had been folded back over the perineum (see photo above.) This led Smith to believe that Ramesses V had suffered from an inguinal hernia or a hydrocele. Smith also found a large ulcer-like lesion in the right groin which he stated could be an open bubo. His use of this term raises the possibility of yet a third cause of death (bubonic plague) for the king. Original Burial: KV 9. Elizabeth Thomas has noted an ostracon which gives the date of Ramesses V's interment as Year 2 3 3ht 2 of Ramesses VI, but which does not indicate the place of his burial. Although Ikram and Dodson express some uncertainty regarding the original burial place of Ramesses V, Reeves confidently states that he was buried in KV 9 along with Ramesses VI. 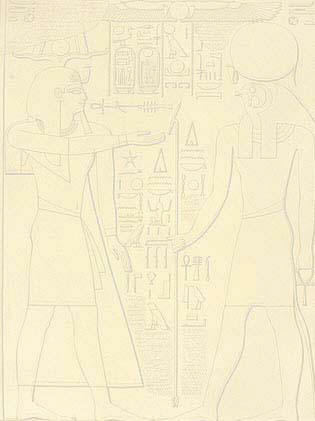 The latter king is often said to have usurped the tomb from Ramesses V, but Reeves points out that inscriptions bearing the cartouche of Ramesses V, located in the first several corridors of the tomb, were allowed to remain intact, indicating that the two kings probably shared the tomb. Had Ramesses VI wanted to erase the memory of a predecessor whose tomb he was appropriating, he surely would have had these cartouches defaced or removed in some manner. Robberies and Inspections: Reeves notes that an investigation into the robbery of KV 9 is recorded in Papyrus Mayer B, and proposes that thieves gained entrance into the tomb through KV 12, which intersected KV 9. This particular papyrus fragment is not dated and Reeves points out that it cannot be connected to the other tomb robbery papyri with certainty. If the robbery referred to in the papyrus is the one which occasioned an official visit to the tomb, noted on an inscription on the ceiling of the burial chamber (see Wall Docket translation below), then (according to Cyril Aldred) the KV 9 robbery can be dated to sometime before Year 9 of Ramesses IX. Photo Credit: RM (Cairo, 1912,) pl. LV. For high resolution photos of Ramesses V see the University of Chicago's Electronic Open Stacks copy of Smith's The Royal Mummies (Cairo, 1912,) Call #: DT57.C2 vol59, plates LV, LVI, LVII Recent color images of the mummy of Ramesses V may be seen at the Eternal Egypt website. Details: The mummy of Ramesses VI was found in side chamber Jb of KV 35 (at position 8--see diagram.) It had been severely damaged by ancient tomb robbers. When unwrapped by G. E. Smith on July 8, 1905, the remains were in complete disarray beneath the 21'st Dynasty wrappings, and Smith comments that the king's body had "literally been hacked to pieces." Smith noted that the 21'st Dynasty restorers had to use a rough section of wooden coffin board on which to tie and reassemble the sundered parts of the battered mummy in order to reinforce it and give it the semblance of mummiform shape. Ikram and Dodson identify this board as being part of the king's original coffin. The head of the mummy had been shattered and the bones of the face were missing. The right forearm and right wrist had been chopped off. The King’s hip bone and pelvis were found among the bones at his neck, while his elbow and humerus were discovered on the right thigh. Among the confusion of the king’s remains were found bones from two other mummies. The right hand of an unidentified woman was bound in with the remains of Ramesses VI, as well as the right hand and forearm of a man. The skull of Ramesses VI also displayed a type of piercing superficially similar to that discovered in the skulls of Merenptah, Seti II, Ramesses IV and Ramesses V. Harris and Weeks speculate that the remains of Ramesses VI had been targeted for such severe desecration because he may not have been the legitimate heir to the throne. They refer to an undated papyrus, probably deriving from the reign of Ramesses VI, which mentions a kind of insurrection or civil war that took place at the time of this king's accession. Such civil unrest may have been stirred up by a rightful claimant to the throne who later took maximum revenge upon the mummy of the usurping Ramesses VI. However, Harris and Weeks admit that this theory is purely speculative. 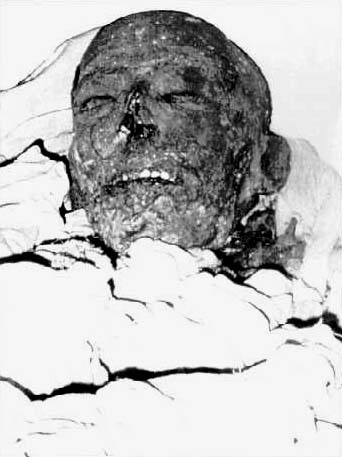 Smith noted that Ramesses VI had been embalmed in a fashion similar to that of his two predecessors. The cranial cavity had been packed with linen and resin-paste. Resin-paste had also been thickly plastered over the face, eyes, and forehead. The king's ears had been pierced, and his teeth were only moderately worn. Smith estimated his age at death as being sometime in early middle-age. Details: Although found in the DB320 cache and shipped to Cairo at the same time as the other DB320 mummies, the mummy of Ramesses IX was never examined by G. E. Smith, and no data about it appears in Smith's published works. Reeves writes that the mummy appears to be superficially intact and has never been completely unwrapped. The head had become detached from the body at some point in time, but whether this was caused in ancient times or by more modern examiners remains unclear. Ikram and Dodson assert that the mummy is damaged considerably, and note that the nose is missing and that the skin of the mummy is badly cracked. Photo Credit: From the collection of Ángel González y Arema, Theban Royal Mummy Project associate researcher. Recent color images of the mummy of Ramesses IX may be seen at the Eternal Egypt website.